Hamish Redux is the second in the McAllister Chronicles, and leads on from the end of the first novel in the series, Second Death. If you haven’t read Second Death, or even if you have, and you don’t want any clues as to what happens in the second novel, don’t read any further…. 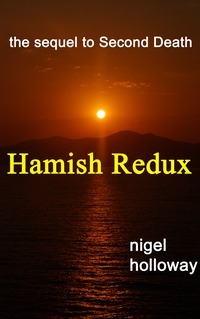 After Hamish’s suicide in the full spotlight of the world’s media, far from leaving Hamish and Elizabeth in peace to enjoy eternity together in worlds of their own choosing, someone is desperate to get him back. Someone with the resources and the overwhelming incentive to get Hamish to help him in his nefarious objectives: someone who is never going to take ‘no' for an answer. But what could anyone do to persuade Hamish to help him? Here’s the video trailer I made in 2017 for the book - look out for characters you might recognise! To see it, click here. And there’s a shorter one you might like - with a completely star-studded cast! To see it, click here.